CHICAGO— When Iowa coach Kirk Ferentz broke his tradition of seniors only for the second time in his 20-year stint with having a non-senior participate in Big Ten media days on Tuesday, then there might be something unique about that athlete. Junior quarterback Nate Stanley fit the bill as one of three Hawkeye player representatives in Chicago with Josey Jewell (2016) being the other. Another common thread the two players share are exceptional leadership traits as they are the only juniors in Iowa program history to be selected as captains by their teammates. Stanley earned his status as he could have easily rode the bench, but earned the starting job over Tyler Wiegers last season. “I think that just tells you how far Nate came last year, from being a guy we weren't sure was going to start in August, at this time last year we didn't know who our starter was, and really had a good season," Ferentz said. "But most important, I think he's gained the respect and confidence of his teammates. Despite the accolades in the locker room, Stanley’s 55.8 percent completion mark wasn’t the flashiest, but the potential is there for improvement under second year offensive coordinator Brian Ferentz. “Individually and for the whole team, one of the main things we are trying to focus on is build consistency throughout every aspect— whether it be third down accuracy, completion percentage, all of those statistical categories that were up and down last year to try and keep them at a high level,” Stanley said. The return of quarterbacks coach Ken O’Keefe last season after spending 13 seasons as an offensive coordinator in his first run at Iowa has been an invaluable resource for Stanley. “[Nate and Brian] have a really good rapport and communicate frequently, plus having Ken O’Keefe back has been great for us,” Ferentz said. “Ken has been with our program for a long time and has been a great resource him and the other quarterbacks to lean on in the office. 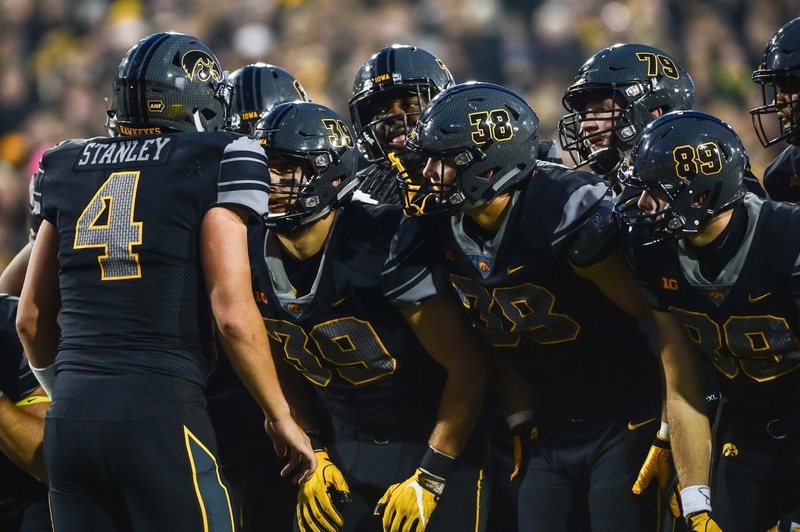 Iowa’s first major test comes on Sept. 22 as it hosts West division foe Wisconsin in Iowa City and Stanley can right a wrong from last season’s meeting in Madison. Stanley statistically played his worst game as a Hawkeye going 8-of-24 (33.3 percent) an interception and a 39.3 quarterback rating as the Badgers ran away with a 38-14 win. The setback was a blemish on an otherwise productive 2017 through the air with 26 touchdowns and five interceptions. Stanley’s presence at the media days was a message from the Hawkeyes to the rest of the college football world that they are all in and any hopes of winning the Big Ten West division will run through the signal caller.